Location: Born and raised in Omaha,NE. Trying to scratch out a living doing fine art in the midwest. Why would clear contact paper be a bad idea? Don't overthink it... I melt the wax and mix it with the naptha. Straight wax would work just as well. I thin it not to get too much excess ( for reasons mentioned) but more importantly to speed up drying time. You don't want to wait a week for me to ship in the winter months. Can you give some details on how the naptha wax mixture is made? Sounds like something I can wipe onto a sacrificial mdf board for glue ups instead of wax paper. Wax paper is a pain, sometimes when tightening up joints it tries to fold up and get caught between the two. Out of curiosity what brand of wax are you using? I'm liking the idea of a 3/8" mdf board overlay that rides over my mft table. (with a bunch of holes cut to match the mft top) soaked in your wax mixture. I typically use Butchers Wax, but I don't think brand matters much. But definitely naptha... not alcohol if you're going to thin. If you want to use this new board in combination with the MFT top and use it for clamping using the Festool clamps, I may be wrong, but I don't think that the clamps will insert thru due to the new thickness. I actually did think of that that's why I went with 3/8's rather than 1/2 inch top. If that would be too thick I would probably make the holes a tad bigger in order to angle the clamp through. Geez, Roger, it sure takes you a long time to get things done. thanks for the recipe, lol. Contact paper might be a good idea too, its alot thicker so most likely wont get folded into the joint as I close the gap up. Just realized the picture is missing from the first post. 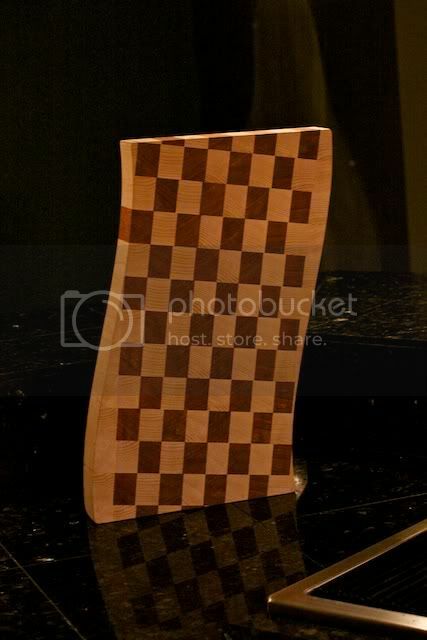 Said cutting board... And I believe it is still a cutting board to this day.